LAS VEGAS — A San Gabriel man faces up to 360 years in prison and $4.5 million in fines for defrauding La Vegas casinos out of more than $1 million, authorities said. De Rong Shang, also known as Jason Shang, 50, was convicted Tuesday in federal court of 1 count of conspiracy to commit mail fraud and 17 counts of mail fraud, U.S. Attorney’s officials said in a written statement. He was ordered to return to court for sentencing July 16. Shang, along with co-defendant Yuli Eaton, 47, of Redlands, who pleaded guilty before trial, used recruits to obtain casino credit marker in the scam, officials said. Shang would give the recruits money to open bank accounts, which they would in turn use to obtain credit from casinos, according to the U.S. Attorney’s Office. The recruits then played baccarat, using a technique called “rolling the chips” to make it look as if they were losing money while, in reality, they were actually just hiding them and transferring them to co-conspirators. When the casinos tried to collect the money they were owed from the recruits’ bank accounts, officials said, it was discovered the accounts had been either drained or closed. Shang was due back in court for sentencing July 16. NORWALK — A judge sentenced a 24-year-old man to 21 years in prison Thursday for his role in the slaying of a Pico Rivera grandmother who tried to stop him and three accomplices from tagging on a wall near her home. Cesar Lopez received his sentence from Norwalk Superior Court Judge Dewey Falcone. He had pleaded no contest to a voluntary manslaughter charge with gang enhancements in exchange for his testimony against the other three defendants in the Aug. 10, 2007 shooting death of 57-year-old Maria Hicks. Co-defendants Angel Rojas, 21, Jennifer Tafolla, 24, and Richard Rolon, 25, have also been convicted for their roles in the incident on San Gabriel River Parkway and Woodford Street in Pico Rivera. Rojas was convicted of first-degree murder, shooting at an occupied vehicle, street terrorism and unlawful firearm activity. The jury also found true special allegations that the crime was done for the benefit of a street gang, Brown Authority, and that he personally fired the bullet that killed Hicks. Rojas could face life in prison when he returns to court for sentencing April 25, official said. Tafolla and Rolon were convicted of street terrorism, which carries a maximum sentence of three years, and released on time served. Lopez had crossed out another gang’s graffiti on a wall when Hick’s spotted the vandalism and flashed headlights at the four suspect, according to investigators. Rojas then opened fire on Hick’s car, striking her in the head. SANTA FE SPRINGS — A 73-year-old nonprofit museum volunteer died Thursday when a tractor he was riding overturned and crushed him, authorities said. The dead man’s name was not released Thursday. Police described him as a longtime Santa Fe Springs resident who had been volunteering for the Hathaway Ranch and Museum, 11901 Florence Ave., where the accident occurred, for more than a decade. The deadly accident was reported about 11 a.m., Whittier police Officer Bradley White said in a written statement. “Apparently, the male involved was riding the tractor on the agricultural site when it tipped over,” White said. Firefighters pronounced him dead at the scene. The nonprofit museum highlights Santa Fe Springs’ history and showcases oil drilling exhibits, agricultural exhibits and historic artifacts. BALDWIN PARK — A search for a kidnapper was called off Thursday after a group of elementary school students admitted making up a story of seeing a girl abducted, officials said. The incident began about 10:40 a.m. when three 5- to 6-year-old students at Margaret Heath Elementary School, 14321 School Street, told officials they saw a man grab a young girl from the campus, put a bag over her head and run away with her, Baldwin Park police Capt. Michael Taylor said. Police responded to the school in force, ordering a campus lockdown and setting up a search perimeter in the neighborhood around the school, the captain said. As the investigation continued, “We took a head count of all students and found everyone was accounted for,” Taylor said. Police then re-interviewed the students who reported the kidnapping, and they admitted making up the story, he said. The motive for the false kidnapping story was unclear. The lockdown was lifted about an hour after it began. PASADENA — Prosecutors Thursday were still considering whether to file charges against a Pasadena man accused of lying about an armed robbery over the weekend, starting a chain of events that ended with the fatal shooting of a 19-year-old Azusa man by police. Oscar Felipe Carrillo Gonzales, 26, was arrested Wednesday on suspicion of manslaughter in connection the late Saturday’s officer-involved shooting, which left Kendrec McDade dead, Pasadena police officials said. Police presented their evidence to the Los Angeles County District Attorney’s Office Wednesday, however prosecutors had not determined Thursday whether Carrillo Gonzales would be charged, or what crime he would be charged with, according to district attorney’s officials. Criminal defendants being held in custody are generally arraigned within two court days of arrest. Because courts are closed Friday for the Cesar Chavez holiday, a determination could potentially not be made until Monday. According to county booking records, Carrillo Gonzales remained jailed Thursday in lieu of $25,000 bail. AZUSA — Two men were hospitalized, one of them by helicopter, following a two-car crash Thursday, officials said. The crash involved a pickup truck and an SUV took place about 9:40 a.m. at 6th Street and Azusa Avenue, Los Angeles County Fire Department officials said. The driver of the SUV suffered what appeared to be moderate injuries, however a helicopter was landed at the soccer field of near by Azusa Pacific University in order to rush the man to a trauma center as a precaution, fire Capt. Dave Middleton said. Another man who was a passenger in the SUV was unhurt. The driver of the pickup truck suffered minor injuries and was hospitalized via ambulance, the captain said. The cause and circumstances of the crash were being investigated by the Azusa Police Department. LA PUENTE – A La Puente man was shot and injured Wednesday night by three suspects who fled in a car. The shooting happened at 8:38 p.m. in the 1100 block of Stimson Avenue. Sheriff’s Lt. John Saleeby said a man walked out of his house and was shot. He thinks the victim was hit in the lower body. Saleeby said the injured man was taken to Los Angeles County USC Medical Center. His medical condition wasn’t known. The three suspects, described only as Latinos, were in a beige Honda. SANTA FE SPRINGS — Police jailed a wanted Pico Rivera man who ran from a traffic stop Wednesday, officials said. Alfonso Gonzalez, 22, was being held without bail due to a warrant stemming from a narcotics case, Whittier police Officer Bradley White said. Whittier police officers patrolling in Santa Fe Springs pulled over a car about 11:50 a.m. in the 8000 block of Boer Avenue, the officer said. The driver, later identified as Gonzalez, ran from the car and into a nearby apartment complex, White said. “Whittier officers surrounded the apartment complex and discovered the reason he may have fled was a (narcotics) warrant. After a two-hour search, he officers found him in the area and arrested him. COVINA — A massive water main break flooded and buckled a portion of San Bernardino Road early Thursday in an unincorporated county area near Covina. The incident was first reported at 8:51 a.m. on San Bernardino Road at Nora Avenue, according to Los Angeles County Fire Department officials. 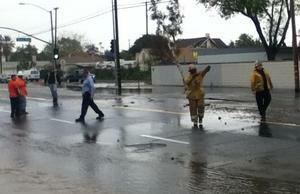 Firefighters and police quickly blocked off the road between Orange and Nora avenues as crews shut off the flow of water and assessed the damage to the roadway. At it’s peak, the busted water main turned the right-hand lanes of San Bernardino Road into rivers for a full city block. The road was closed to both directions of traffic through the morning, and the right-hand lanes of borth directions of San Bernardino Road remained closed to traffic Thursday afternoon. SANTA FE SPRINGS — A hazardous materials clean-up crew responded to the corner of Alondra Boulevard and Carmenita Road after several gallons of contaminated water spilled at a metal processing company. There appeared to be no public health risk, and no injuries were reported in connection with the spill of several gallons of aluminum sulfate solution, which took place shortly after 7 a.m. at Heraeus Metal Processing Inc., 13429 Alondra Blvd., Santa Fe Springs Fire Department clerk Barbara Chapman said. Firefighters cordoned off the area and worked to prevent the chemical from seeping into storm drains as a company contractor cleaned up the spill, she said. Neighboring businesses were not evacuated due to the spill, Chapman said.